The 26th edition of the festival took place from 30 October to 2 November. After two years in other venues, we were back at the "Espace Reuilly", with its large, comfortable screening room. Due to the absence of a long weekend, the schedule was shortened to just three full days plus opening night. Consequently, the selection was narrowed down to 48 films from 20 countries. These elements probably contributed to the slightly reduced attendance levels compared to the previous year (-1.8%), with 1244 memberships. The proportion of reduced membership fees went down slightly, while supporting memberships continue to increase (+4%). A large number of festival goers contributed to the solidarity system of "suspended tickets" that was put in place in order to enable festival goers with limited resources to attend screenings. The overall number of tickets sold fell, with a total of 3816 (-3.4%) while the average number of tickets per screening rose. The most popular screenings reflect the diversity of the festival itself and include the feature films Tru Love (543 spectators) and Concussion (342), the 2 shorts series Une séance nommée désir (402) and Courts sur pattes (265), the opening night screening preceded by a concert by the group Eau'rageuses and the feature documentary Alice Walker: Beauty in Truth (347) as well as another feature-length documentary, Golden Gate Girls (274). The festival's other activities had to be adapted to the smaller venue: the expo showed the work of just three artists, as well as participative performances; tables were squeezed in tighter at the cafeteria, and there were fewer stands around Violette and Co. - the lesbian-feminist bookstore that celebrated its 10th anniversary with numerous book signings. Debates and discussions were organised on Saturday and Sunday afternoon in a room rented out at the nearby "Le Chantier" cultural centre. Although efforts made by the various commissions allowed for a significant reduction in costs, higher attendance levels would have had to be reached in order to balance the budget. Nevertheless, the deficit has been reduced by two thirds compared to 2013, and now represents just 4.4% of the overall budget. 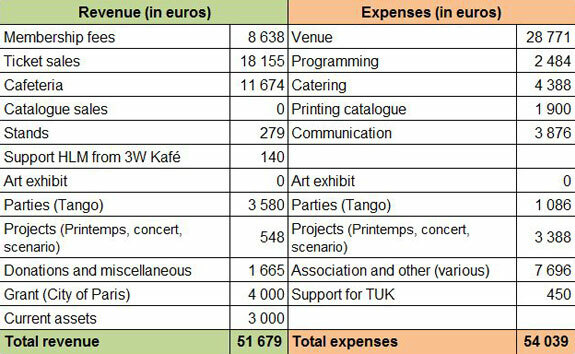 Reduced expenses were made possible in part by the shorter, 4-day festival (rental fees for the venue and equipment, security services, screening fees for films, shorter catalogue). However, the video equipment for the large screening room is more expensive, and the share of the budget dedicated to communication has gone up (9.2% of expenses), even though more and more communication has come out of the budget, thanks to the development of non-print means of communication (internet, social networks, partnerships with media and associations). These actions rely largely on the commitment of our volunteer organizing team. The translations and subtitles, also done free of charge, have led to publicity exchanges with other festivals, and generated some additional revenue this year. Proceeds from the cafeteria are on the rise (4.6%) thanks to a significant reduction in supply costs. Operating costs have gone down despite the rise in insurance premiums and storage space rental fees. The 5th Cineffable Spring Fest took place on May 14th in Olympe de Gouges Hall (in Paris). Despite disappointingly low attendance, the event managed to make a profit of €450, the totality of which was donated to the Talented Ugandan Kuchus (TUK) our partners in organising the event. In addition, since September 2014, regular screenings have been held in partnership with the 3W Kafé. The City of Paris has renewed its €4000 subsidy. Over the course of the year, the 2011 and 2012 screenplay awards were paid out to their respective winners. The first, Waterproof, was screened at the 26th edition of the festival and the second, A qui la faute ?, will be screened at the next festival. No prize was awarded in 2014, as the jury did not find the one submitted screenplay to be compelling enough to warrant it.